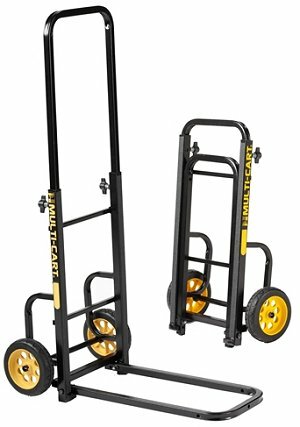 Multi-Cart® Extended Nose 2-Wheeler has long 18” nose to ergonomically transport bulky equipment but folds to a small size. 6”x1.50” R-Trac lightweight no-flat wheels. 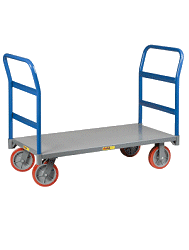 Non-skid surface on frame resists cargo slipping. Stairclimbers ease loads over curbs. Sturdy tubular steel frame with textured powdercoat paint resists chips and scratches. The Mini Multicart I bought is just right for my use. Its smaller size, light weight, and in particular its narrower width allow me to transport a portable folded up massage table strapped longways on the extended nose with ease. It is lightweight, easy to handle and sturdy. Everything in it is okay even its load capacity is awesome. Except for the size of the wheels which I find rather small. It's a great cart!